Have you ever hosted an Easter Egg Hunt? 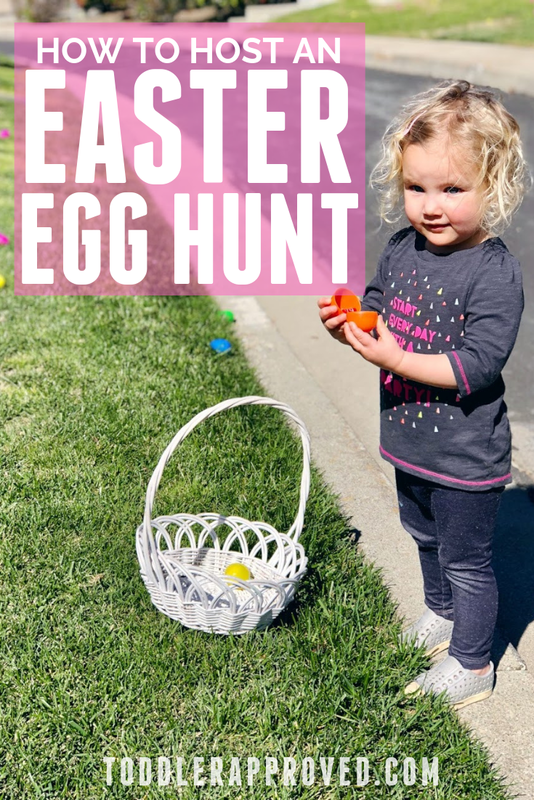 Easter Egg Hunts are such simple activities to host whether you are just doing it for your family or your entire community! The goal is for everyone to have fun and get some Easter Eggs! Isn't hosting an Easter Egg Hunt easy? Yes! Hosting an Easter Egg hunt can be easy if you plan ahead, think through the details, and communicate well! How do you get started planning an Easter Egg Hunt? 1. Identify your guest list! Before you start planning, you need to figure out your guest list! Is this just for toddlers? Are older siblings invited? How many kids will be allowed to participate? This will determine how many eggs you will need. Also, figure out how you will solidify your guest list. Will you have registration? Have friends RSVP via Evite or email or text? The larger your group, the more information you will need. The worst thing that can happen at an egg hunt is for one child to get 2 eggs while another gets 10 and someone to be crying and upset. Knowing your guests will help you organize things so all kids get some eggs and have fun! If your group is super small and you'll only have 3-5 kids, then this little hosting guide might be too much info for you! 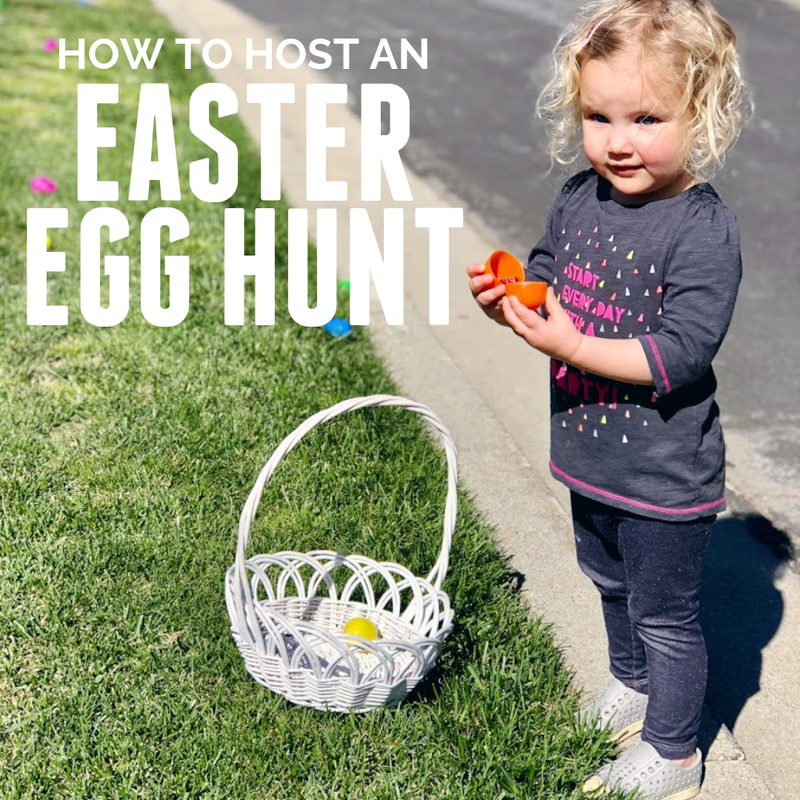 All you may need to do is have each parent bring a few eggs and keep things much more casual. This little guide is more for those planning a larger hunt. 2. Decide how many eggs each child will get! We usually plan for 8-10 eggs per kids. Toddlers can have as few as five, since some toddlers will only pick up 1-2. Some toddlers are so excited about that first egg and the candy inside that they don't need any others eggs. For a friend gathering or small group, I will often ask each family that is coming to a hunt to bring 10 eggs per child for us to hide. 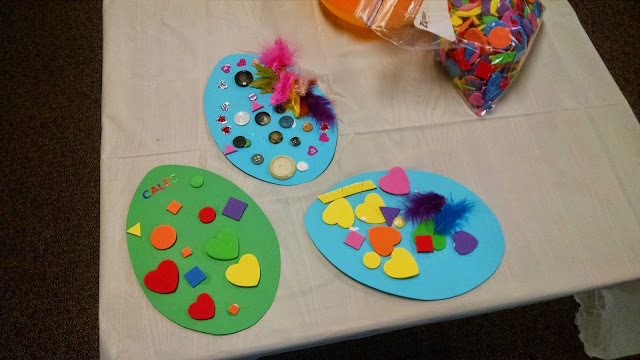 If I am hosting a community egg hunt and we are collecting money for registration, then I will buy and stuff all of the eggs with help from my kids and friends. I always try and make sure that I have all of the stuffed eggs ahead of time (day before), so that I can count them and make sure we have enough. 4. Send out an text/invitation/registration with an RSVP! Each Spring I host a local egg hunt for young children. I always send out an Evite or email invitation. I ask for an RSVP by a certain date so that we make sure we can plan ahead for snacks and eggs. We also do the same with egg hunts with a group of friends or our play group. 5. Plan some simple activities! 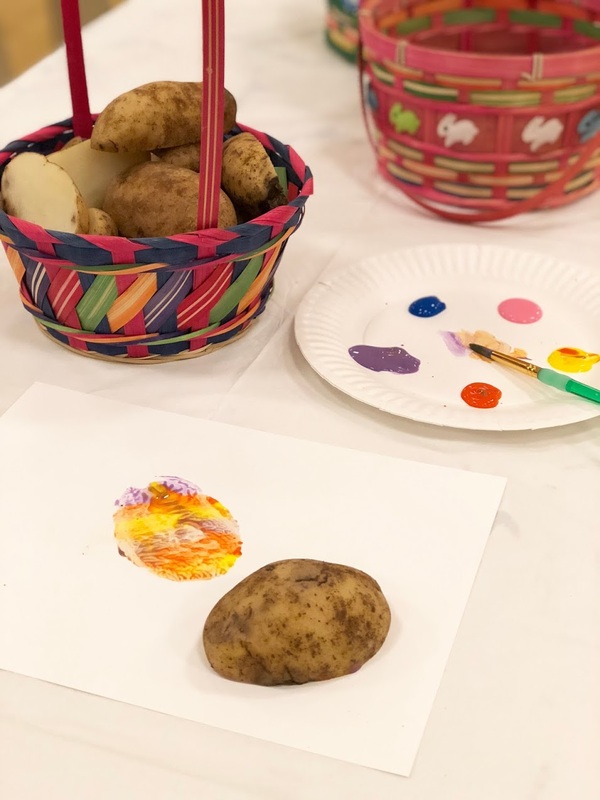 We always love to have some simple Easter themed activities planned for the kids during the event! 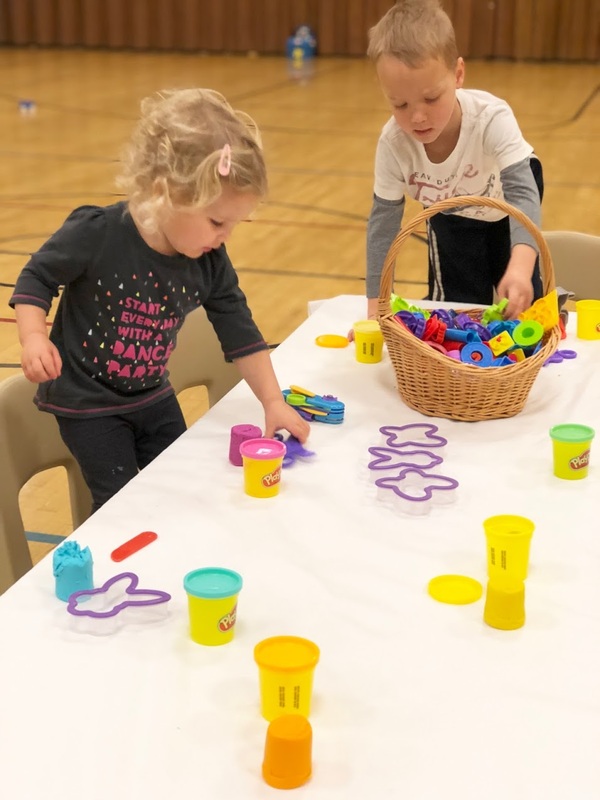 Not everyone will arrive right on time, so we like to have some activities for the kids to do while we make sure all of the eggs are hidden and the hunt is ready to go! This is usually what our table looks like at the end... lol.. but it is totally worth it! Having some simple snacks on hand is great and also having a spot where kids could decorate an Easter sugar cookie can be fun! Before the egg hunt gets started, make sure you clearly explain the rules to the kids and the parents! Once you turn a bunch of three-year-olds loose around a bunch of candy filled eggs, it can be a bit chaotic. You need to make sure that ALL of the parents are aware of how many eggs there are for each child and make sure they know that if their little Tommy or Susie picks up 25 eggs right away... they will need to put them back. Easter Egg Hunts are not fun if one child only gets 2 eggs and another one is sitting on a pile of 30 eggs. Make sure as the adult in charge that you are ok with enforcing these rules (or ask some other parents to help you out and nicely enforce them). Obviously there may be some kids that do not want 10 eggs! They may be perfectly fine with 2. If you have any eggs leftover at the end of the hunt you can ask all of the kids to put them together and equally distribute them out. Usually once all of the 1-2 year olds have their designated amount of eggs, I'll let the older 3-4 year olds (or older) find any harder to find eggs. I also enlist the older kids in helping the younger kids find some eggs if they have already hit their quota. With older kids (5+), we may even have 12 eggs. I don't think any kids need more than 12 pieces of candy... but that is just my opinion! With large groups of kids (50-100+), you will want to divide the kids up into age groups. I love to find teenage volunteers to help me with these bigger community hunts. They are amazing at finding fun hiding spots for the older kid's eggs. We typically invite kids ages 10+ to help with the hunt instead of participating! For the younger kid hunts, often we just throw the eggs in pretty visible spots on the grass. For the older kids, we spend more time hiding the eggs. If you have a smaller group, then you can keep everyone together in one hunt and hide some in harder spots and some in easier spots so that everyone has fun. We usually host a different age group every 15 minutes for our big community hunts. This gives us time to let kids hunt and then let our volunteers set out some more eggs for the next age group. 8. Have some snacks/drinks for the adults! Make sure everyone has a good time and bring food/drinks for all ages. Some sort of water station is especially important if you are outside and it is hot. Where we live the weather could be freezing, rainy, or hot during March/April so it is hard to plan! 9. Have a back up plan! If you are hosting an egg hunt outside, make sure you have a back up plan if it ends up raining. If you have a local church you are using, it is easy to hide eggs in classrooms if it is rainy (on chairs, under chairs, behind tables, etc). One year the grass had just been watered by the sprinklers right when we were ready to start our egg hunt! We had to adjust and have the egg hunt in some bushes/dirt area and on some pavement. It all worked out! Just plan to be a little flexible! If you are hosting in a park or a local community area outside, you may want to alert people about a rain date ahead of time! One year it was so rainy that we ended up having to cancel and we never got to have our hunt! 10. Host near a playground! If possible, host your hunt in a field near a playground. This provides inexpensive entertainment for the kids while they are waiting for their turn to hunt. Be smart about what you fill your eggs with! Make sure you are aware of your audience and any allergies. We try and avoid chocolate and anything with nuts. Chocolate candies will melt if the sun is on the eggs for long. You can also fill your eggs with non candy prizes. Some of our favorite easy candy prizes for littles ones are Starbursts, colored Tootsie rolls, and fruit snacks. Do you have any other favorite egg fillers that are non-candy prizes or candy prizes? What other questions do you have about hosting an Egg Hunt? Have you hosted one before? Do you have any other tips we should add to our list? Want to try some other fun Easter activities? 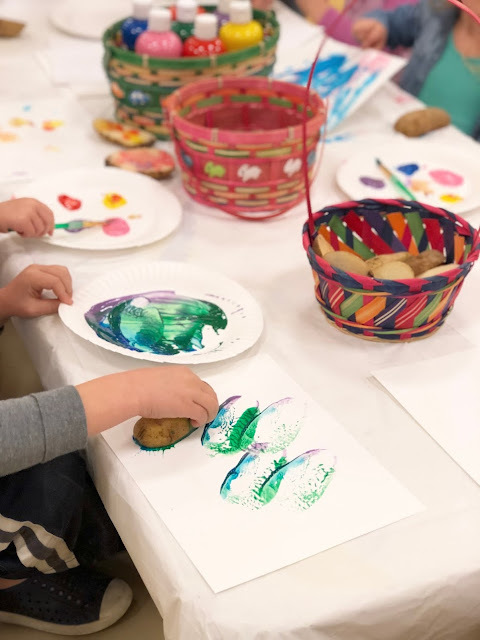 Here are three other favorite Easter activities we love!